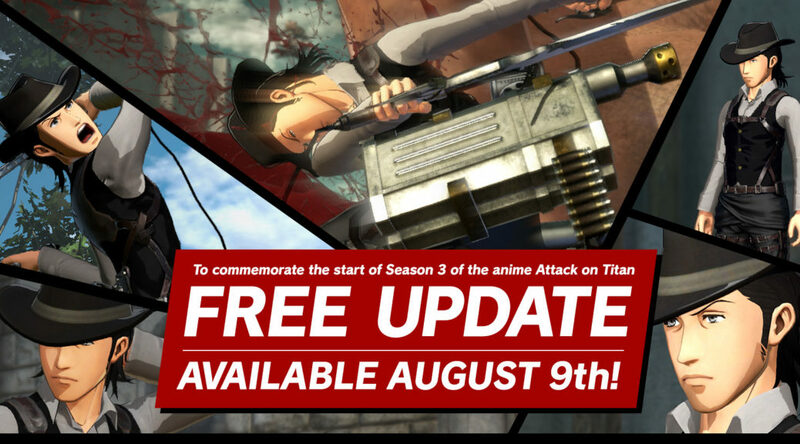 On August 9, Koei Tecmo will release a free update for Attack on Titan 2 owners on Nintendo Switch. The update will add a new playable character called Kenny, who was first seen in the third season of the Attack on Titan anime. A new “Heaven” difficulty mode, ability to practice online-only modes offline, and other features are planned for the update. A new character, Kenny, has appeared in Season 3 of the anime “Attack on Titan.” Players will be able to equip his hat in character creation. Recreate Kenny and take him for an omni-directional mobility whirl to drive off the terrible Titans. In the Heaven difficulty, consumables like gas and blades, as well as battle items such as smoke signals, have unlimited usage, allowing players to focus more on the actions themselves. Original characters can equip some of the unique skills of the characters from the anime, allowing players to assemble all the skills with powerful effects. Skills are learned after beating the anime character with that skill after that character has reached level 10. Ultimate Blade Art Greatly reduces blade durability losses on sufficiently speedy attacks. Natural Tactics Allied soldiers’ attack power increases greatly as more soldiers fight together. Strength of Unity Attack power increases greatly as more soldiers fight together. Easily Pleased Greatly increases the damage of the next attack after acquiring a Complete Elimination medal. Survival Instincts Acquire multiple items when linking up with allied soldiers. Goddess Grin Acquire multiple items when linking up with allied soldiers. Wings of Freedom Press button repeatedly while attacking to perform a powerful multiple-hit attack. Research Heart Greatly increases damage done by attacks using tools. Devotee Greatly increases attack power while a battle alert signal is raised and increases length of time effects last. The “Showdown” and “Expulsion” modes were distributed as online only modes. Now players will be able to practice and polish their skills before actually going online. In addition, the completion reward for Titan Biological Research Report has been changed from Titan Research Room EXP to a Generic Statement of Deployment. It’s now also possible to carry out a Titan Biological Research Report without using any Wings of Freedom. Functionality to choose the in-battle background music has been added to the selection screens for scout missions and past missions. Select from all unlocked BGM listed in the gallery. Multiple pieces of equipment can now be developed at once. Also, up to 30 materials can be chosen at a time when reinforcing equipment. Generic Statements of Deployment have been added to the regiment store. It is now possible to skip certain camerawork during battle.